YouTube had stood in top place in video content and over a billion of hours of video content is has been watched daily on YouTube platform. There is no doubt that YouTube platform is the biggest and largest video destination across the web like no other platform in the present web world. The platform has announced its new TV streaming services for the people and thus trying to dump the traditional cable wires across the globe. Presently, it had just given a statement about its new services which will be very soon available for US people initially. Innovations change the way of living with technology. Technology always targets the comfort, novelty and development. We all habituated to watch our favorite TV shows, programs and many other movies, sports through Cable providers. We just stick to the TV whenever our favorite show was aired on TV. We used to change the daily schedule accordingly to watch the favorite shows and even some of us might cancel their tours for some important programs that are aired, worrying about missing the shows. This scenario had seen in our days before advanced technology and smart devices. We make our schedules, commitments basing on the time given and announced by the cable TV schedule. The new change begins with the Dish TV or setup boxes and streaming services which had opened a new chapter in TV consumption. With the advent of internet streaming services, the Cable operators are almost in dilemma about their continuation of the services competing with the streaming services. Most of the people across the countries didn’t have a clear idea about what they are getting from Cable TV and what they are getting from Streaming. Cable operators provide the multiple shows with more than hundred plus channels which include the regional and live programs. ESPN and other sports channels come with a basic cable connection but the real-time exclusive and high-quality content like NFL, NBA, NHL types of games cannot be able to access with the Cable. If you are missing these type of content and were on your top priority list, the cable TV can’t be your perfect choice to consume the content. Flexibility is ruling the world today. People are expecting for the most comfortable and flexible world to live happy and comfortable all the time. The streaming services allow the users to sign up as well as to cancel the subscription without any terminating fees. They provide great viewing experience with high definition video quality. The new episodes of a program or a show can be available to watch and are easy to access. Streaming services are cheaper than the cable connections. • YouTube platform had announced the new services which deliver all major channels of television for just 35 dollars per month as a subscription. • Users can access the OTT content of four broadcast networks namely ABC, NBC, CBS and Fox networks. • The new DVR tool will be provided for the subscribers for recording the TV shows with unlimited storage for recording and saving in the cloud. • The shows users had saved for 9 months will be automatically get deleted from the cloud. • Subscribers can watch the shows on smart devices, laptop and tablet,computers. • The mobile applications to large screen can access the content and transforms as TV sets. • A specialized application was designed by the YouTube to access the streaming TV services. • YouTube had designed its service for users like whenever, whatever and wherever the users like to watch the TV, they can access the high-quality top notch content through YouTube streaming services. • The main advantage of using the YouTube TV services is its low-cost subscription comparing to the other streaming services. • The flexibility of viewing the content is also the key advantage for the subscribers as they can access their favorite TV shows to OTT content whenever and wherever they like to watch without any commitments. • It came with an advantage for the branding comparing with the other competitors in the same field. • The YouTube TV was organized with the three most user-friendly tabs for watching, scrolling and library tab. • The home page of the app will provide the recommendation of the content that is presently trending on live TV. • The notification related to the upcoming TV shows information and for recording is also one of the trending features. • The most comfortable, interesting and most advantageous feature that is trending on Youtube TV is its unlimited cloud storage for recordings. • It displays the trending and the most interesting content for users basing on their interests and recommendations. • It can create great buzz with its new service features in future. • The personalized user experience can be availed within a single Youtube TV subscriptions. YouTube TV will definitely dump down the cable cords with its new, interesting and most capable Tv streaming services across the smart devices. We can predict more personalized experience that Youtube can provide its TV subscribers in future. YouTube TV will become the next big thing in the TV streaming services. More content channels will get collaborate with the YouTube TV to offer their services. We can predict the value of the Youtube TV market will definitely increase along with the new features for the YouTube TV subscribers. YouTube presently targeted the sports lovers with its new TV services as people can access the program and a variety of games at high quality through YouTube TV. 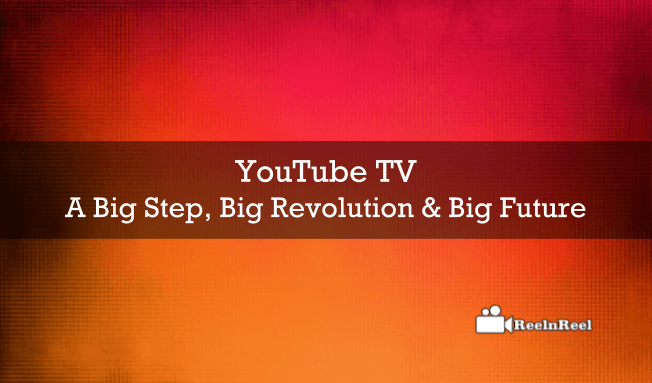 There is no doubt to declare that YouTube TV will be the future Television system and it will definitely become the biggest thing across the web. Feeling excited for new announcements and updates from the YouTube TV. Stay connected with ReelnReel for more updates with detailed information.